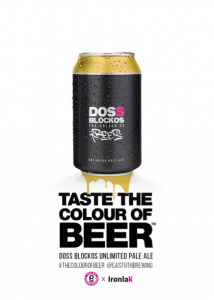 Independant St Kilda brewery, East 9th Brewing, has released its ‘Doss Blockos: The Colour of Beer Unlimited Pale Ale’, along with a new trademark on the colour of beer, aptly named, ‘The Colour of Beer™’. 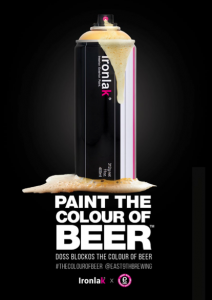 In partnership with Australian street artists Sofles and art supplies distributor Ironlak, East 9th’s beer is being co-released with Ironlak’s new ‘The Colour of Beer’ spray paint. 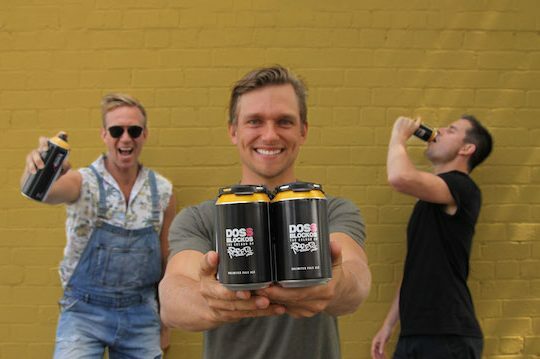 “The can design of the new Doss Blockos: The Colour of Beer imitates the iconic Ironlak spray-can design,” Benjamin Cairns explained. East 9th’s latest brew is being released simultaneously with its supporting paint from Ironlak across the USA, Europe, Asia and Australia. East 9th is not the first brand to trademark a colour in the Australian commercial space, with Cadbury owning the shade of purple ‘Pantone 2685C’, Tiffany’s owning ‘robin’s egg blue’ and ANZ owning ‘ANZ’s colour blue’. While these are examples of companies monopolising colours to maximise branding and ensure differentiation over competitor product on shelves, East 9th’s claim to the colour of beer seems more a publicity feat than anything else. Being controversial is hardly an off-brand move for East 9th, with others in its Doss Blockos range such as the ‘Hempire Hemp Ale’ and ‘F*ck The Rent Golden Ale’. With an Instagram account with over thirteen thousand followers, frequently posting provocative content, East 9th’s demographic seems to welcome a playful marketing approach. East 9th’s choice to distribute in cans rather than glass bottles aligns with the recent popularity of cans among independent brewers. Manufacturing is significantly cheaper, and brewers say that cans offer a superior environment for beer, and are more efficient in transport and storage. 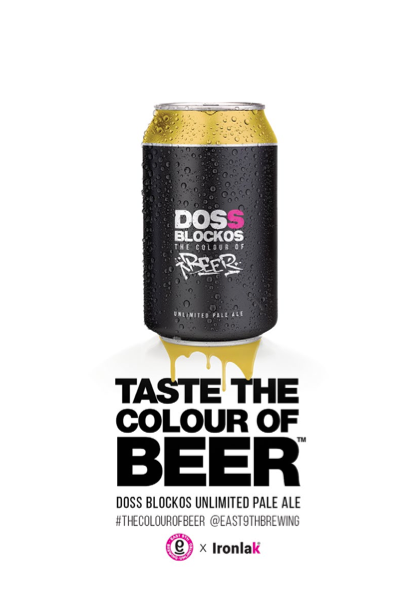 The ‘Doss Blockos The Colour of Beer Unlimited Pale Ale’ will retail in per four-can packs. “It’s the type of beer that the East 9th Team love to drink – it’s generous on the tropical notes…without being too heavy on the bitterness”, praised Cairns.